Dr. Catherine Maloof has a burning passion to heal and see her patients happy, a zeal born of a personal understanding of what it means to suffer from health challenges. 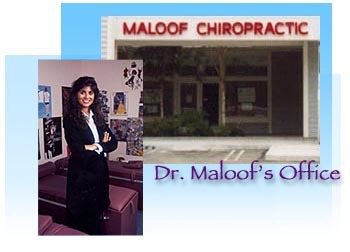 Dr. Maloof attended the University of Connecticut and received her Bachelor of Science Degree and Doctorate at The Los Angeles College of Chiropractic. Her dream was to become a doctor, but at that time, she couldn't settle on a specialty. She was very involved in athletics from a young age but suffered from sinus and allergy problems. Worst of all she became addicted to antihistamines and nose spray. Her mother eventually took her to a chiropractor who adjusted her spine and her sinus problems disappeared. It was then she realized her calling, that she could be part of a profession to help people without drugs or surgery. Her Mission? To educate people so they understand what Chiropractors actually do for their patients. A stereotype exists where many people believe that Chiropractors only adjust bad backs and deal with back pain, but a bad back can cause a wide variety of physical ailments. Your nervous system affects your immune system. Nerve compression of the spinal column can literally pinch the nerves to your organs so they operate less efficiently. Most people neglect their spinal column, sometimes suffering from ailments caused by an injury to the spine 20 or 30 years prior, until the pain and symptoms arise. It's never too late to be helped. For seventeen years, Dr. Maloof has dedicated her life to continually study new ways to help the body naturally. She incorporates many techniques in her practice. She treats newborns, women through their pregnancy, athletes, busy executives, and senior citizens as well. Her techniques are very gentle and she treats the three components of health, physical, nutritional and emotional. Her techniques include Diversified adjusting, BEST(Bioenergetic Sychronization Technique), NET(Neuroemotional Technique), CRA(Contact Reflex Analysis), and AK(Applied Kinesiology). With her expertise she is able to give you a specialized treatment according to your individual needs. Q: What happens on the first visit to Dr. Maloof ? A: First, Dr. Maloof will have a consultation with you to determine the main problem and discuss your past history. Then a complete chiropractic, orthopedic, and neurological examination is done. Now x-rays are taken in the areas of the spine that are necessary. The history, examination, and x-rays are evaluated and then your first chiropractic adjustment is given the next day. Q: Do you have to take x-rays? X-rays are a vital ingredient in determining the specific areas in the spine that need correction. They also show us any birth defects in the spine as well as degenerative changes, arthritis, osteoporosis, scoliosis,and alignment. There is minimal radiation, our office has a computerized x-ray machine using rare earth screens at a high speed so it is not harmful to your body. Q: How much does it cost? Will I be able to afford to come in? A: Most insurance companies cover chiropractic at 80% coverage. If you do not have insurance, we have affordable individual, couple, and family plans. Chiropractic is for everyone and should be a family affair. I believe cost should not get in the way of getting proper health care. Q: Are Chiropractors real doctors? How long do you have to go to School and what type of degree do they receive? A: Yes, Chiropractors are real doctors. After receiving an undergraduate degree. Chiropractic school is three and one-half years year-round or five years with summer breaks, consisting of 4485 hours (for medical doctors 4248 hours). Three sets of National Boards must be passed before taking the State Board. After passing the State Board you are an official Doctor of Chiropractic. Q: What is the popping noise when the Chiropractor adjusts my back? A: The popping noise is just gas being released in the joint when the vertebrae is being realigned and it is not harmful. Q: Is it okay for me to crack my own back? A: When you crack your own back, what you are really trying to do is loosen up an area in your spine that is tight or painful. A Chiropractor adjusting the spine is different than you cracking your own back because Chiropractors are adjusting specific vertebrae that need to be corrected. When you crack your own back you are adjusting areas in your spine that are too hypermobile (moving too much), therefore this puts additional wear and tear on your spine and as you get older this will cause degeneration in your spine. Q: Once I get adjusted by a Chiropractor will I have to come back for the rest of my life. A: A Chiropractic treatment plan depends on how long you have had a problem and how severe it really is. There are three phases of care: Relief Care, Corrective Care, and Maintenance Care. My patients choose the type of care they want. Many of my patients choose to stay on Maintenance Care and get regular tune-ups because they see the direct benefit in their health, energy, and vitality. A: Dr. Maloof uses a wide range of techniques that are very gentle and effective. It actually feels good to have your spine adjusted. Some people are apprehensive because it is a new experience for them, but an adjustment done properly is very gentle, quick, and painless. Q: I feel great! I exercise, eat right, I'm in good shape. Why do I need to see a Chiropractor? A: You may be feeling great but a subluxation (pinched nerve) in the spine may exist for 10, 20, or 30 years before a symptom is ever felt. Waiting for a danger signal is dangerous! If you wait until you are in pain, usually the problem will take longer to correct. The best time to get your spine checked is when you feel great. Q: I heard Dr. Maloof adjusts babies. Why would my child need to see a chiropractor? My baby is just perfect. A: During a normal birth delivery, an infant experiences major trauma where 40-60 pounds of pressure is exerted on the infants head and neck. Various studies have linked that spinal damage can cause many problems such as ear infections, colic, ADD, asthma, scoliosis and even SIDS (sudden infant death syndrome). It is important to have your child checked as early as possible to keep them growing healthy. Dr. Catherine Maloof is a Sports Chiropractor with more than a decade of health care experience. She can help your athletes achieve peak performance in their sport. Having been an athlete all her life, involved in swimming, tennis, and basketball, she understands what it takes to achieve optimum results. Injuries can ruin your sports career if not properly corrected. Dr. Maloof is an author of books and videos pertaining to health and wellness. She specializes in treating sports injuries through a myriad of techniques including Applied Kinesiology and Nutritional Therapy. Her objective is to correct the injury and get you back in the game as quickly as possible. A Chiropractor balances your spinal column and relieves stress on your muscles, ligaments, tendons, and nerves. Sports injuries nearly always jar and misalign your spine and the structures near it. A trauma to anywhere in the body can damage your spine. A blow to the ribs, legs, feet , head, shoulder or torso can radiate to it. If you play any sport you should receive a chiropractic spinal check-up to ensure that your spine is balanced and free from misaligned vertebrae causing "pinched"nerves(spinal subluxations).